Hello Everyone! It's time for another Classy Cards N Such Saturday! 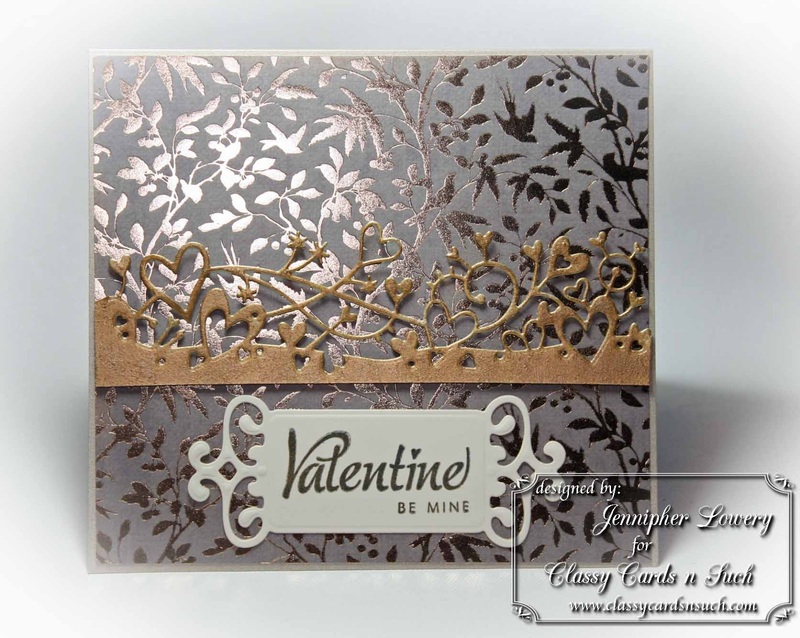 This is the day of the week that I share my cards created with products from the Classy Cards N Such Online Store. Today, I have a clean, simple, yet elegant Valentine card to share with you. I started with a 6 x 5.5 base of Champagne Reich Shine. To that I added a layer of the beautiful leaf foil paper from the Magnolia Grove paper pad. Using some gold cardstock and the Cherish Border by Memory Box, I die-cut a border to place a little further down from the center. I popped the border up by using the Joy Foam Pads. Next, I used the Spellbinders Fancy Tags and some vanilla paper to die-cut a tag to stamp my sentiment on. And that's it! I told you it was simple. Have you started on your Valentine's yet? If you haven't Classy Cards N Such Online Store is an excellent source of fun-loving dies and papers for the occasion. The foil is amazing!! Very pretty and romantic! Beautiful papers, Jennipher! Your card looks so elegant. What beautiful paper Jennipher.. Gorgeous card. Oh my goodness, Jennipher!! This is gorgeous!! Maybe CAS to make but so elegant and beautiful!! Oh my Jenn what a beauty and that paper just yummy. this is utterly gorgeous !